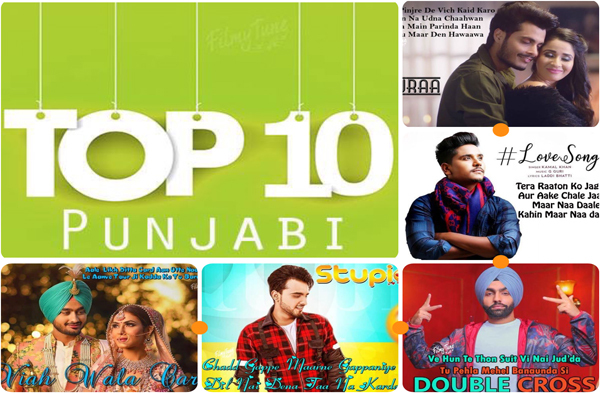 Top 10 Punjabi Songs 2018 Week 48 ( टॉप १० पंजाबी सॉन्ग्स २०१८ ) – Pollywood new Punjabi songs with lyrics of all latest hit movies and video album music : 26th November 2018 to 02nd December 2018. Pinjraa Song is a Punjabi Album Soundtrack. It is starring Gurnazar Chattha and Maggie Thakur. Tru Makers (Dilsher Singh and Khushpal Singh) are the Video directors. Pinjraa Lyrics have been written by Jaani. Gurnazar Chattha is the Singer. The Music Composer is B Praak. Love Song Lyrics have been written by Laddi Bhatti. Kamal Khan is the Singer of this Latest Punjabi song. The Music Composer is G Guri. The Song is featuring Kamal Khan and Anaya Shah. The Video director is Ashray Khurana. Viah Wala Card Song is a Punjabi album soundtrack. The Star casts of this video song is Ravneet and Mansha Bahl. Jatinder Jeet Sandhu is the Lyricist. Ravneet is the Singer. The Music Director is Mack Sandhu. Stupid Latest Punjabi Song is starring Armaan Bedil and Priyanka Khera. The Singers are Armaan Bedil and Raashi Sood. Starboy MusicX is the Music Composer. Lets Talk Do Gallan Lyrics have been written by Garry Sandhu and he has also sung this new Punjabi song. The Music Director is Rahul Sathu. It is featuring Garry Sandhu. Avex Dhillon is the Video director. Qehar Song is an album soundtrack. The Starcast of this new Punjabi video song is Mehtab Virk and Sonia Mann. Mehtab Virk is the Singer. The Music Director is Starboy. The Lyricist is Aardee. Double Cross Lyrics have been penned by Happy Raikoti. Ammy Virk is the Singer of this latest Punjabi song. The Music composer is Ikwinder Singh. Sukh Sanghera is the Video director of this beautiful song. Hello Hello Song is a New Punjabi album soundtrack. It is featuring Rajvir Jawanda and Elwa Saleh. The Singer is Rajvir Jawanda. Lyricist is Panjit Sherpur. The Music composer is Mix Singh. Down Load is a new album song. The Landers and Gurlez Akhtar are the Singers of this latest Punjabi song. Rab Sukh Rakhy has written the lyrics of song. The Music Directer is Mr. VGrooves. This Video directer is Team DG. Note Muqabla Lyrics have been written by Narinder Batth. Goldy Kahlon (Goldy Desi Crew), Satpal Malhi and Gurlez Akhtar are the Singers of this new Punjabi song. The Music composer is Desi Crew. It is starring Goldy Desi Crew, Satpal Malhi and Sara Gurpal. Our experts have created this list on the basis of response. Kindly share your views to improve Top 10 Punjabi Songs 2018 Week 48. We are trying to serve you better. Stay Connected with us on Twitter & Facebook.